Background: The fructus of Kochia scoparia Schrader (Chenopodiaceae) is a traditional herbal medicine that has been used for treating gonorrhea and dermatitis. 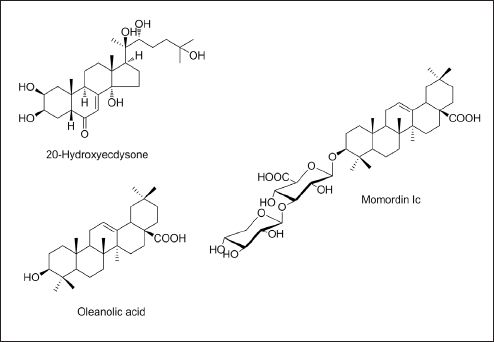 Objective: We investigated the anti-inflammatory activities of three marker compounds, including 20-hydroxyecdysone, momordin Ic, and oleanolic acid, from the fructus of K. scoparia. Materials and Methods: The simultaneous analysis of three components was performed using high-performance liquid chromatography and high-performance thin-layer chromatography. We evaluated the anti-inflammatory effects of the nine marker compounds by determining their anti-inflammatory activities in the murine macrophage cell line RAW 264.7. Results: Among three marker compounds, momordin Ic, but not 20-hydroxyecdysone and oleanolic acid, had inhibitory effects on the production of inflammatory cytokines tumor necrosis factor-alpha (TNF-α) and interleukin-6 (IL-6) in LPS-treated RAW264.7 macrophages. 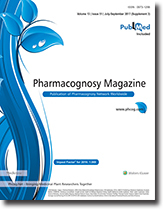 The effects of three marker compounds on prostaglandin E2(PGE2) were also evaluated. All three compounds significantly reduced PGE2production in LPS-treated cells. Conclusions: We suggest that momordin Ic is the most potent phytochemical of the fructus of K. scoparia as an anti-inflammatory agent. Abbreviations used: HPLC: High-performance liquid chromatography; TNF-α: Tumor necrosis factor alpha; IL-6: Interleukin-6; PGE2: Pro-inflammatory mediator prostaglandin E2; LPS: Lipopolysaccharide. Objective: This study aimed to investigate the cytotoxicity, apoptosis induction, and mechanism of action of steviol on human breast cancer cells (Michigan Cancer Foundation-7 [MCF-7]). Materials and Methods: Sulforhodamine-B assay was performed to analyze cytotoxic potential of Steviol whereas flow cytometer was used to analyze cell cycle, apoptosis, and reactive oxygen species generation. 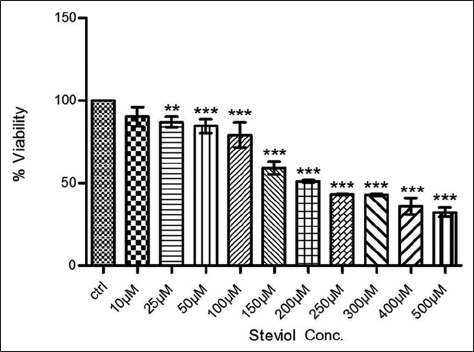 Results: Studying the viability of cells confirms the IC50of Steviol in MCF-7 cells which was 185 μM. The data obtained from fluorescence-activated cell sorter analysis reveal Steviol-mediated G2/M-phase arrest (P < 0.05) in addition to the presence of evident sub-G0/G1 peak (P < 0.05) in the MCF-7 cells, signifying the ongoing apoptosis. Conclusion: Thus, results suggest that induction of apoptosis in MCF-7 cells was due to dose-dependent effect of Steviol. Our first in vitro findings indicate Steviol as a promising candidate for the treatment of breast cancer. Abbreviations used: MCF-7: Michigan Cancer Foundation-7; SRB: Sulforhodamine-B assay; FACS: Fluorescence-activated cell sorter; ROS: Reactive oxygen species; DNA: Deoxyribonucleic acid. Background: To determine the antitumor effects and its mechanism of n-butanol fraction from aril of Torreya grandis (BFAT) on H22mice models of liver cancer. Materials and Methods: Sixty ICR male mice were used to establish H22mice models of liver cancer and then randomly divided into six groups, the normal control group, the model control group, the positive group (cyclophosphamide [CTX]), the BFAT-treated group (high, 4 g/kg, medium, 2 g/kg, and low, 1 g/kg). The animals were sacrificed 15 days after oral administration, and tumors were taken out for the tumor weights and antitumor rates, while thymus and spleen were taken for thymus index and spleen index. Blood in eyeball was collected for the determination of aspartate aminotransferase (AST), alanine aminotransferase (ALT), albumin (Alb), malondialdehyde (MDA), superoxide dismutase (SOD), glutathione peroxidase enzyme (GSH-Px), tumor necrosis factor-α (TNF-α), interleukin-2 (IL-2), transforming growth factor-β1 (TGF-β1), and IL-10 in serum. Sections of tumor tissue were prepared, and morphological changes in tumor tissue cells were observed using hematoxylin and eosin staining technique. 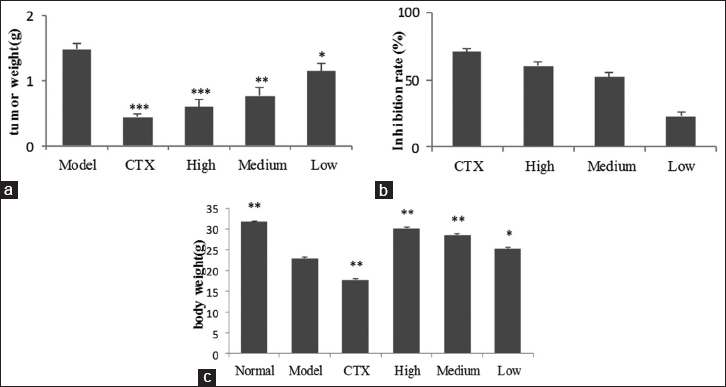 Results: Compared with the model control group, the tumor inhibition rate of the high-dose administered group is 60.15%, which is quite closed to the effect of CTX. Moreover, the tumor weight is decreased, the indexes of spleen, thymus were increased significantly. Furthermore, the administration of BFAT significantly enhanced the activities of TNF-α, IL-2, SOD, and GSH-Px and reduced the levels of AST, ALT, MDA, Alb, TGF-β1, and IL-10 (P < 0.01). Conclusions: The results demonstrated that n-butanol fraction from aril of T. grandis showed out antitumor activity without obviously liver damage through potentiating immunologic function and antioxidant activity of tumor-bearing mice and which may become one potential as anticancer drug alternatives or supplements. Abbreviations used: DDP: Cisplatin; CTX: Cyclophosphamide; AST: Aspartate aminotransferase; ALT: Alanine aminotransferase; Alb: Albumin; MDA: Malondialdehyde; SOD: Superoxide dismutase; GSH-Px: Glutathione peroxide enzyme; TNF-α: Tumor necrosis factor-α; IL-2: Interleukin-2; TGF-α1: Transforming growth factor-α1; IL-10: Interleukin-10; HE: Hematoxylin and eosin; PBS: Phosphate- buffered saline; PFAT: Petroleum ether fraction from aril of Torreya grandis; EFAT: Ethyl acetate fraction from aril of Torreya grandis; BFAT: N-butanol fraction from aril of Torreya grandis. Background: Dregea sinensis Hemsl. plant of the genus Dregea volubilis (Asclepiadaceae), plays a vital role in anticancer, antidepression, and immunoregulation. Steroidal glycosides are the main constituents of this herb, which were significant biological active ingredients. Objective: The objective of this study is to recognize the mechanism of anticancer, antidepression, and immunoregulation of D. sinensis Hemsl. Materials and Methods: Seventy-two steroidal glycosides of D. sinensis Hemsl. were evaluated on the docking behavior of tumor-associated proteins (PI3K, Akt, mTOR), depression-related proteins (MAO-A, MAO-B) and immune-related proteins (tumor necrosis factor-α [TNF-α], tumor necrosis factor receptor 2 [TNFR2], interleukin-2Rα [IL-2Rα]) using Discovery Studio version 3.1 (Accelrys, San Diego, USA). 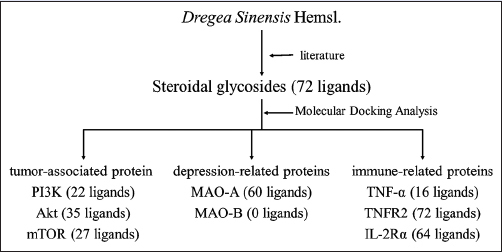 Results: The molecular docking analysis revealed that mostly steroidal glycosides of D. sinensis Hemsl. exhibited powerful interaction with the depression-related protein (MAO-A) and the immune-related proteins (TNFR2, IL-2Rα). Some ligands exhibited high binding energy for the tumor-associated proteins (PI3K, Akt, mTOR) and the immune-related protein (TNF-α), but MAO-B showed none interaction with the ligands. Conclusion: This study has paved better understanding of steroidal glycosides from D. sinensis Hemsl. as potential constituents to the prevention of associated cancer, depression and disorders of immunoregulation. Abbreviations used: PI3K: Phosphatidyl inositol 3-kinase; Akt: Protein kinase B; mTOR: Mammalian target of rapamycin; MAO-A: Monoamine oxidase A; MAO-B: Monoamine oxidase B; TNF-α: Tumor necrosis factor α; TNFR2: Tumor necrosis factor receptor 2; IL-2Rα: The alpha subunit (CD25) of the interleukin-2 receptor; DS: Discovery Studio; PDB: Protein Database Bank; 3D: three-dimensional. Background: The seed oil of Zanthoxylum bungeanum Maxim (ZBSO) is considered to be rich source of fatty acids, mainly oleic and linoleic acids, and has been used for the treatment of burns in Chinese medicine. Objective: We evaluated the healing efficacy of ZBSO and explored its possible mechanism on scalded rats. Materials and Methods: Sprague-Dawley rat models with deep second-degree burns were set up, and ZBSO (500 and 1000 μl/wound) was topically applied twice daily for 7 days and then once daily until wound healing. The therapeutic effects of ZBSO were evaluated by observing wound closure time, decrustation time, wound-healing ratio, and pathological changes. Collagen type-III, matrix metalloproteinase-2 (MMP-2), MMP-9, phospho-nuclear factor-κB (p-NF-κB) p65, inhibitor of NF-κB subunit α p-IκBα, and inhibitor of NF-κB subunit α (IκBα) expression were determined using Western blotting. Results: The ZBSO-treated group showed a higher wound-healing ratio and shorter decrustation and wound closure times than the untreated group. The topical application of ZBSO increased collagen synthesis as evidenced by an increase in hydroxyproline level and upregulated expression of collagen type-III on days 7, 14, and 21 posttreatment. A reduction in MMP-2 and MMP-9 expressions also confirmed the collagen formation efficacy of ZBSO. Furthermore, there was a significant increase in superoxide dismutase levels and a decrease in malondialdehyde levels in ZBSO-treated wounds. ZBSO also decreased tumor necrosis factor alpha, interleukin-1 (IL-1) β, and IL-6 levels in serum, upregulated IκBα, and downregulated p-NF-κB p65 and p-IκBα expression in vivo, indicating the anti-inflammatory action of ZBSO. Conclusion: ZBSO has significant potential to treat burn wounds by accelerating collagen synthesis and the anti-inflammatory cascade of the healing process. Abbreviations used: ECL: Enhanced chemiluminescence; ECM: Extracellular matrix; ELISA: Enzyme-linked immunosorbent assay; GC-MS: Gas chromatography-mass spectrometry; HRP: Horseradish peroxidase; HYP: Hydroxyproline; IκBα: Inhibitor of NF-κB subunit α; IL: Interleukin; MDA: Malondialdehyde; MMP: Matrix metalloproteinase-2; NF-κB: Nuclear factor-κB; SFE: Supercritical fluid extraction; SOD: Superoxide dismutase; SSD: Silver sulfadiazine; TCM: Traditional Chinese medicine; TNF: Tumor necrosis factor. Background: Fructus Aurantii (FA) derived from the dried, and unripe fruit of Citrus aurantium L. is one of the commonly used traditional Chinese medicines to treat gastrointestinal motility dysfunction diseases. According to the literature research, FA flavonoids (FAF) are important active ingredients of FA promoting gastrointestinal motility, but the exact material basis and mechanism of action are still not very clear. Objective: This experiment was designed to illustrate the material basis of FAF promoting gastrointestinal motility and explore the mechanism of action from an organic and inorganic combination point of view. Materials and Methods: In this experiment, high-performance liquid chromatography (HPLC) method was used to analyze the composition and content of FAF. Based on the prominent prokinetic effect of FAF on mice, the mechanism of action was speculated through a combination of HPLC coupled with quadrupole time-of-flight mass spectrometry (HPLC-QTOF-MS) and inductively coupled plasma mass spectrometry (ICP-MS). Results: With the method of HPLC, ten dominating components of FAF including neoeriocitrin, narirutin, rhoifolin, naringin, hesperidin, neohesperidin, neoponcirin, naringenin, hesperetin, and nobiletin accounting for more than 86% of FAF were identified. 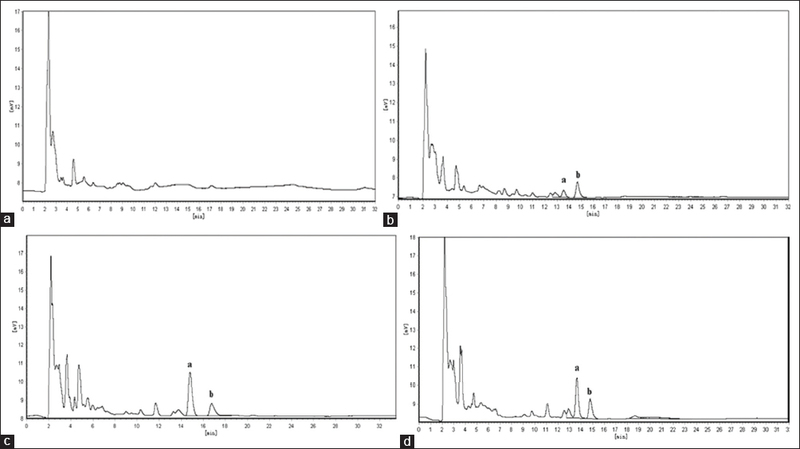 Combined HPLC-QTOF-MS with ICP-MS, the endogenous substances with difference in the blood of mice were analyzed, in which 4-dimethylallyltryptophan, corticosterone, phytosphingosine, sphinganine, LysoPC (20:4(5Z, 8Z, 11Z, 14Z)), LysoPC(18:2 (9Z, 12Z)), and Ca2+, Mg2+, Zn2+ metal ions had significant changes, involving tryptophan metabolism, corticosterone metabolism, sphingolipid metabolism, and other pathways. Conclusion: The results preliminarily elaborated the mechanism of FAF promoting gastrointestinal motility from an organic and inorganic point of view, which provide valuable information for researching and developing new multi-component Chinese medicine curing gastrointestinal underpower associated diseases. Abbreviations used: FA: Fructus Aurantii; FAF: Fructus Aurantii flavonoids; HPLC: High performance liquid chromatography; HPLC-QTOF-MS: High performance liquid chromatography coupled with quadrupole time-of-flight mass spectrometry; ICP-MS: Inductively coupled plasma mass spectrometry; PCA: Principal components analysis; CG: Control group; FAFLG: Low-dosage group of Fructus Aurantii flavonoids; FAFMG: Middle-dosage group of Fructus Aurantii flavonoids; FAFHG: High-dosage group of Fructus Aurantii flavonoids; DPG: Domperidone group. The prevalence of overweight-obesity and associated comorbidities have reached alarming levels necessitating the need to explore effective therapeutics. In the present work, we demonstrated the promising antiobesity activity of ethanolic fraction of Terminalia tomentosa bark (EFTT) in diet induced obese rat model. High Fat Diet (HFD)-fed obese rats were orally administered with EFTT (50, 100 and 200 mg/kg body weight). Changes in body weight, body composition, bone mineral concentration, bone mineral density, plasma glucose, insulin, leptin, adiponectin, circulatory and tissue lipid profiles, and the activities of liver antioxidant enzymes, key lipid metabolic enzymes and mRNA expressions of fatty acid synthase (FAS), peroxisome proliferator-activated receptor gamma (PPAR-γ), leptin and tumor necrosis factor alpha (TNF-α) were assessed in experimental rats in the presence and absence of EFTT. At a dose of 200 mg/kg b.wt, EFTT has substantially attenuated body weight and related patho-physiological alterations in HFD-induced obese rats. These findings were correlated with histological observations of adipose tissue. The therapeutic activity of EFTT could be possibly through restoration of antioxidants status, regulation of key lipid metabolizing enzymes, expression of FAS, leptin, PPAR-γ and by synchronized control of energy metabolism in liver and adipose tissue. Background: Plantago major has been reported to have anticancer and anti-inflammatory properties. However, its antiproliferative and anti-inflammatory mechanisms have not been fully elucidated. Moreover, which plant parts are more suitable as starting materials has not been explored. Objectives: To investigate the antiproliferative activity of P. major extracts against MCF-7, MDA-MB-231, HeLaS3, A549, and KB cancer cell lines as well as their effects on inflammatory cytokines (tumor necrosis factor [TNF]-a, interleukin [IL]-1β, IL-6, and interferon [IFN]-g) production by lipopolysaccharide (LPS)-stimulated THP-1 macrophages. Materials and Methods: The methanol and aqueous extracts of P. major from different plant parts and its chemical compounds, i.e., ursolic acid (UA), oleanolic acid (OA), and aucubin were tested in this experiment. Results: Methanol and aqueous extracts of P. major seeds exhibited the greatest antiproliferative activity. The methanol extracts of seeds also demonstrated the highest inhibition of TNF-a, IL-1β, IL-6, and IFN-g production. Interestingly, the roots, which were commonly discarded, exhibited comparable activities to those of leaves and petioles. Furthermore, UA exhibited stronger activities than OA and aucubin. Conclusions: The seeds are being proposed as the main source for further development of anticancer and anti-inflammatory products, whereas the roots could be included in the preparation of P. major derived products with respect to anti-inflammatory. Abbreviations used: TNF: Tumor Necrosis Factor; IL: Interleukin; IFN: Interferon; HPTLC: High Performance Thin Layer Chromatography; UA: Ursolic Acid; OA: Oleanolic Acid; AUC: Aucubin. Background: Currently, acute upper respiratory tract infections (AURTIs) are increasingly becoming a significant health burden. Gankeshuangqing dispersible tablets (GKSQDT) which have a good effect on treating AURTIs. GKSQDT is composed of baicalin and andrographolide. However, its severe bitterness limits application of patients. Due to the addition of plentiful accessories, common masking methods are unsuitable for GKSQDT. It is thus necessary to develop a new masking method. Materials and Methods: The Previous study showed that baicalin was less bitter than andrographolide. Thus, particle coating technology was adapted to prepare composite particles that baicalin coated on the surface of andrographolide to decrease bitterness. Initially, particle size of baicalin and coating time of composite was investigated to prepare composite. Then, scanning electron microscopy, wettability, and infrared (IR) spectrogram were used to characterize the microstructure of composite. Furthermore, electronic tongue test, animal preference experiment, and human sensory test were applied to evaluate the masking effect. Results: To produce composite, baicalin should be ground in vibromill for 6 min. Then, andrographolide fine powder was added to grind together for 6 min. Contact angle of composite was smaller than mixture, and more similar to baicalin. Other physical characterization including microstructure, wettability, and IR also suggested that andrographolide was successfully coated by baicalin superfine. Furthermore, taste-masking test indicated taste-masked tablets was less bitter than original tablets. Conclusion: The study indicated that particle coating technology can be used for taste masking of GKSQDT without adding other substance. Moreover, it provides a new strategy of taste masking for national medicine. Abbreviations used: AURTIs: Acute Upper Respiratory Tract Infections; GSQDT: Gankeshuangqing Dispersible Tablets; IR: Infrared Spectrogram; LHPC: Low-substituted Hydroxypropyl Cellulose; CAs: Contact Angles; FTIR: Fourier Transform Infrared Spectra. Background: Sepsis plays an important role in acute gastrointestinal injury (AGI). Our research was designed to determine the effects of omega-3 fish oil (FO) in patients suffering from severe sepsis combined with AGI III, and the ability of FO to modulate immune function. 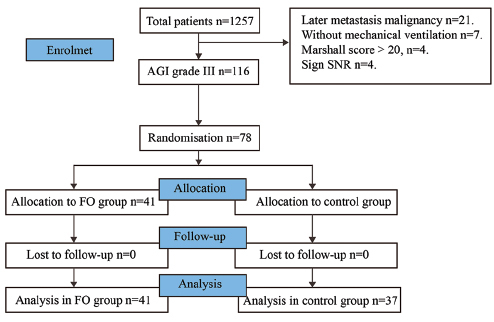 Methods: Seventy-eight patients diagnosed with severe sepsis with AGI III and a need for mechanical ventilation were randomized to two groups. In the FO group, 50 g of long chain fatty acid soybean oil (n = 6) and 10 g of FO (n = 3) were administered as total parenteral nutrition (TPN). The control group was treated with 50 g of long chain fatty acid soybean oil without addition of FO to TPN. Results: At baseline, there were no significant differences between the two groups. The 60-day mortality was lower in the FO group. Multiple factor logistic regression analysis revealed that intra-abdominal pressure (IAP) and abdominal infection were correlated with the FO intervention. The patients with abdominal infection demonstrated a lower mortality rate, fewer CD3 T lymphocytes, and fewer helper/inducer T lymphocytes in the FO group compared with the control group. After 7 days, the Marshall Score was lower in the FO group than in the control group. Conclusion: FO has positive effects in terms of improving the long-term prognosis of patients with severe sepsis with AGI III. Patients with a high IAP and abdominal infection might experience greater benefit from FO. This effect might be due, in part, to immunomodulation. Abbreviations used: AGI: Acute gastrointestinal injury; FO: Fish oil; TPN: Total parenteral nutrition; IAP: Intra-abdominal pressure; ICU: Intensive Care Unit; MODS: Multiple organ dysfunction syndrome; TLR4: Toll-like receptor 4; DNR: Do Not Resuscitate; WGAP: Working Group of Abdominal Problem; EN: Enteral nutrition; BP: Low blood pressure; CRI: Catheter-related infection; PBS: Phosphate-buffered saline; ELFA: Enzyme-linked fluorescent assay; SD: Standard deviation; PUFAs: Polyunsaturated fatty acids; EPA: Eicosapentenoic acid; DHA: Docosahexaenoic acid. Background: Atractylodis rhizoma is one of the most often used drugs in traditional Chinese medicine. Stir frying with wheat bran is the most common processing method. To clarify the principle of processing, an experiment was carried out to compare the tissue distribution of typical constituent after oral administration of raw A. rhizoma and processed ones. Objective: To compare the tissues distribution of atractylodin after oral administration of raw and processed A. rhizoma and clarify the processing principle of A. rhizoma. Materials and Methods: High-performance liquid chromatogram with ultraviolet detection was developed and validated for the determination of atractylodin in rat tissues. Results: The atractylodin in raw and processed A. rhizoma was distributed in all tissues involved in this study. Conclusions: The concentration of atractylodin in it is the highest in the stomach and small intestine. Abbreviations used: IS: Internal standard substance; A. Rhizoma: Atractylodis rhizoma; RSD: Relative standard deviation; HPLC: High performance liquid chromatography. Background: GCSB-5, an herbal drug composition with an anti-inflammatory effect, is prepared by boiling, which is the most common herbal extraction method in traditional Korean medicine. Several parameters are involved in the process, i.e., extractant type, herb-to-extractant ratio, extraction temperature and pressure, and total boiling time. 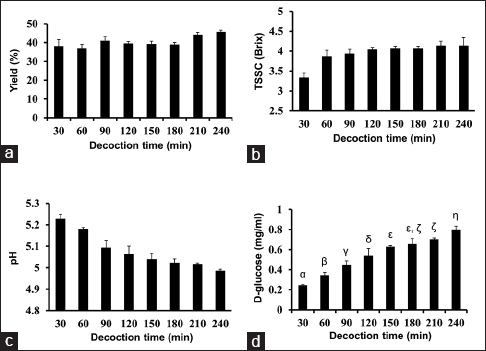 Objectives: The aim of this study was to examine the influence of boiling time on index compound amount and the antioxidative and anti-inflammatory activities of GCSB-5. Materials and Methods: Different samples of GCSB-5 were obtained by decocting for 30, 60, 90, 120, 150, and 240 min. Each sample was tested for hydrogen ion concentration (pH), total soluble solid content (TSSC), marker compound profiles, and antioxidative and anti-inflammatory activity. Results: pH was found to decrease while TSSC increased with extended decoction. Marker compound contents for GCSB-5 (acanthoside D for Acanthopanax sessiliflorus Seem, 20-hydroxyecdysone for Achyranthes japonica Nakai, and pinoresinol diglucoside for Eucommia ulmoides Oliver) remained relatively constant regardless of the length of boiling. Total D-glucose amount increased with longer boiling. The antioxidative and anti-inflammatory potentials of GCSB-5 were not substantially affected by decoction duration. Conclusion: Biological characteristics and marker compound content of GCSB-5 were not altered significantly in prolonged boiling. Abbreviations used: CAM: Complementary and alternative medicine; KIOM: Korea Institute of Oriental Medicine; KMD: Korean medicine doctor; TSSC: Total soluble solid content; pH: Hydrogen ion concentration; HPLC: High-performance liquid chromatography; NO: Nitric oxide; NO2: Nitric dioxide; LPS: Lipopolysaccharide; DMSO: Dimethyl sulfoxide. Background: Fuzi–Gancao herb couple is one of the commonly used herb couples involved in the traditional Chinese medicine formulations, with radix aconiti lateralis (Fuzi in Chinese) and radix glycyrrhizae (Gancao in Chinese) as a ratio of 1:1. Alkaloids and flavonoids were considered as the main active ingredients of Fuzi–Gancao herb couple. 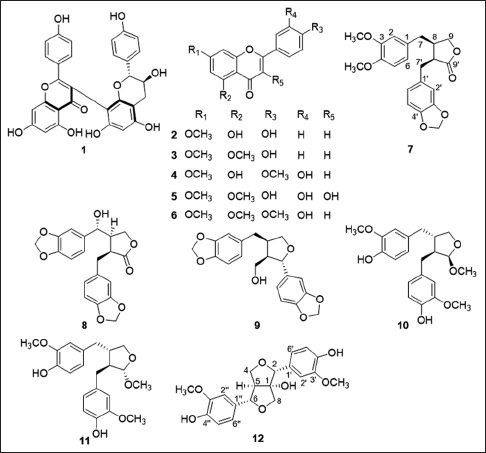 However, no analytical methods have been reported to quantitatively analyze these activity ingredients in Fuzi–Gancao herb couple simultaneously. Objective: To develop a simple, rapid, and sensitive UHPLC-MS/MS method for simultaneous quantitation of six alkaloid and three flavonoid compounds, namely, aconitine (AC), mesaconitine (MA), hypaconitine (HA), benzoylaconitine (BAC), benzoylmesaconitine (BMA), benzoylhypaconitine (BHA), liquiritin, isoliquiritin, and licochalcone A (LCA) in Fuzi–Gancao herb couple. Materials and Methods: The chromatographic separation was achieved using a reversed phase C18 column and a mobile phase consisted of water (0.1% formic acid in water, v/v) and acetonitrile. The detection was achieved in multiple reaction monitoring modes. The optimal mass transition ion pairs (m/z) for quantitation were 646.3/586.5 for AC, 632.4/572.5 for MA, 616.3/556.4 for HA, 604.5/572.5 for BAC, 590.4/540.4 for BMA, 574.1/542.5 for BHA, 419.4/257.1 for liquiritin, 419.4/257.1 for isoliquiritin, and 339.2/121.1 for LCA. Results: Good linearity was observed in validated concentration range for each analyte (r > 0.9992), and the intra- and inter-day precisions were <3.12% and 3.65%, respectively. The recovery ranged from 85.36% to 110.14%. Conclusions: The results demonstrated that the method developed was reliable, rapid, and specific. Moreover, this method was successfully applied to control the quality of Fuzi–Gancao herb couple. Abbreviations used: UHPLC-ESI-MS/MS: Ultra High Performance Liquid Chromatography-electrospray ionization-mass spectrometry; RSD: Relative standard deviations; LOD: Limit of detection; LOQ: Limit of quantification; MRM: Multiple reaction monitor; TCMs: Traditional Chinese medicines. Background: Statins cannot be used for some active liver diseases, which limits its application to some extent. The combined use of statins with other drugs may be one of the ways to solve this dilemma. Objective: This research aims to evaluate the effects of atorvastatin combined with Panax notoginseng saponins (PNS) on rats with atherosclerosis (AS) complicated with hepatic injury. Materials and Methods: Seventy-two male Wistar rats were randomly categorized into control group (without any intervention, Group A) and AS model groups, which were divided into hepatic injury (Groups B–E) and nonhepatic injury (Groups F–I) groups. Hepatic and nonhepatic injury groups were intragastrically treated with 5.5 mg/kg·d atorvastatin (Group B, F), 200 mg/kg·d PNS (Group C, G), 5.5 mg/kg·d atorvastatin + 200 mg/kg·d PNS (Group D, H), and normal saline (Group E, I). After 8 weeks, total cholesterol (TC), triglyceride (TG), high density lipoprotein-cholesterol, low density lipoprotein-cholesterol (LDL-C), and serum calcium were analyzed to evaluate the hypolipidemic effect. Serum alanine aminotransferase (ALT), aspartate aminotransferase (AST), alkaline phosphatase, total bilirubin, and r-glutamyltransferase levels were measured to assess liver function. The thoracic aortas were used for hematoxylin–eosin staining. Results: In both hepatic injury and nonhepatic injury groups, TC, TG and LDL-C levels significantly decreased in Groups B, D, F, and H. ALT and AST levels significantly increased in Group B, but significantly decreased in Groups C and D. The aortic intima thickness was significantly lower in Groups B, D, F, and H than that in the normal saline group. Conclusion: The combination of atorvastatin and PNS treatment showed a significant hypolipidemic effect and hepatic enzyme stability function. Abbreviations used: PNS: Panax notoginseng saponins; AS: Atherosclerosis; TC: Total cholesterol; TG: Triglyceride; HDL-C: High density lipoprotein-cholesterol; LDL-C: Low density lipoprotein-cholesterol; ALT: Alanine aminotransferase; AST: Aspartate aminotransferase; ALP: Alkaline phosphatase; T-BIL: Total bilirubin; r-GT: R-glutamyltransferase; HE: Hematoxylin–eosin. Background: Rattan tea is a medicinal plant that has been used for many years for the treatment of inflammation, fatty liver, tumor, diabetes, and hyperlipidemia. Objective: A green and novel approach based on surfactant-mediated, ultrasonic-assisted extraction (SM-UAE) was developed for the extraction of antioxidant polyphenols from Rattan tea. A nonionic surfactant Tween-80 was selected as extraction solvent. The antioxidant activity was measured by total phenolic content (TPC) and ferric-reducing/antioxidant capacity (FRAC) assay. Materials and Methods: Optimization of extraction parameters including concentration of solvent, ultrasonic time, and temperature were investigated by response surface methodology. The antioxidant activity was measured by TPC and FRAC assay. Results: The optimal extraction conditions were determined as 6.8% (v/v) of aqueous Tween-80, ultrasonic temperature of 54°C, and ultrasonic time of 28.8 min. Under these conditions, the highest TPC value of 360.4 mg gallic acid equivalent per gram of dry weight material (GAE/g DW) was recorded. Moreover, 6.8% (v/v) of aqueous Tween-80, ultrasonic temperature of 54.5°C, and ultrasonic time of 28.4 min were determined for the highest FRAC value of 478.2 μmol of Fe2+/g of weight material (μmol Fe2+/g DW). Compared with other methods, the TPC and FRAC values of 313.5 mg GAE/g DW and 389.6 μmol Fe2+/g DW were obtained by heat reflux extraction using ethanol as solvent, respectively, and 343.2 mg GAE/g DW and 450.1 μmol Fe2+/g DW were obtained by UAE using ethanol as solvent, respectively. Conclusion: The application of SM-UAE markedly decreased extraction time or extraction cost and improved the extraction efficiency, compared with the other methods. Abbreviations used: SM-UAE: Surfactant-mediated ultrasonic-assisted extraction; TPC: total phenolic content; FRAC: Ferric reducing antioxidant capacity; RSM: Response surface methodology; BBD: Box-Behnken design. Background: Berberine is a natural isoquinoline alkaloid possessing various pharmacological effects, particularly apparent in the treatment of diarrhea, but the underlying mechanism remains unclear. Smooth muscle myosin light-chain kinase (MLCK) plays a crucial role in the smooth muscle relaxation-contraction events, and it is well known that berberine can effectively depress the contraction of smooth muscle. Hence, whether berberine could inhibit MLCK and then depress the smooth muscle contractility might be researched. Objective: The purpose of this study is to investigate the effects of berberine on MLCK. Based on this, the contractility of gastro-intestine, catalysis activity of MLCK, and molecular docking are going to be evaluated. Materials and Methods: The experiment of smooth muscle contraction was directly monitored the contractions of the isolated gastrointestine by frequency and amplitude at different concentration of berberine. The effects of berberine on MLCK were measured in the presence of Ca2+-calmodulin, using the activities of 20 kDa myosin light chain (MLC20) phosphorylation, and myosin Mg2+-ATPase induced by MLCK. The docking study was conducted with expert software in the meantime. Results: The phosphorylation of myosin and the Mg2+-ATPase activity is reduced in the presence of berberine. 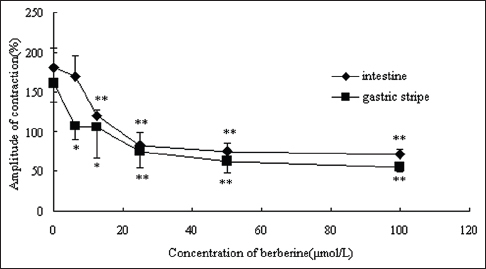 Moreover, berberine could inhibit the contractibility of isolated gastric intestine smooth muscle. 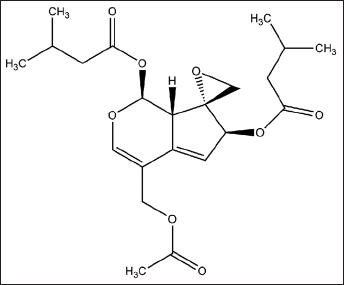 Berberine could bind to the ATP binding site of MLCK through hydrophobic effect and hydrogen bonding according to the docking study. Conclusion: The present work gives a deep insight into the molecular mechanism for the treatment of diarrhea with berberine, i.e., berberine could suppress the contractility of smooth muscle through binding to MLCK and depressing the catalysis activity of MLCK. Abbreviations used: MLCK: Myosin light chain kinase; MLC20: 20 KDa regulating myosin light chain; CaM: Calmodulin. Background: The roots of Eurycoma longifolia Jack have traditionally been used as an aphrodisiac tonic besides the other remedies for boils, fever, bleeding gums, and wound ulcer. Recently, the antiproliferative activity of E. longifolia has been reported and remained attractive to natural chemists. Objective: The objective of this study was to study on antiproliferative compounds from the root of E. longifolia. Materials and Methods: Column chromatography was used to separate individual compounds, spectroscopic data including nuclear magnetic resonances and mass spectrometry were analyzed to determine the chemical structure of the isolates and for biological testing, antiproliferative activity of compounds was tested on seven human cancer cell lines (KATO III, HCT-15, Colo205, HepG2, PC-3, Jurkat, HL-60) by 3-(4,5-dimethylthiazol-2-yl)-2,5-diphenyltetrazolium bromide method. 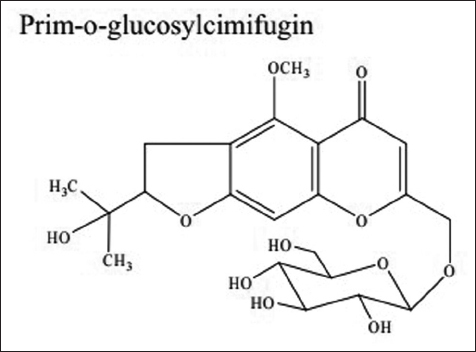 Results: Nine quassinoids including a new C19longilactone-type quassinoid glycoside were characterized from the roots of the title plant. 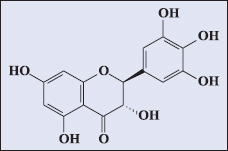 Among them, the major quassinoid eurycomanone exhibited selectively potential antiproliferative activities on the leukemia cell lines (HL-60 and Jurkat) and had very low toxic effects on normal skin fibroblast cell line (NB1RGB). 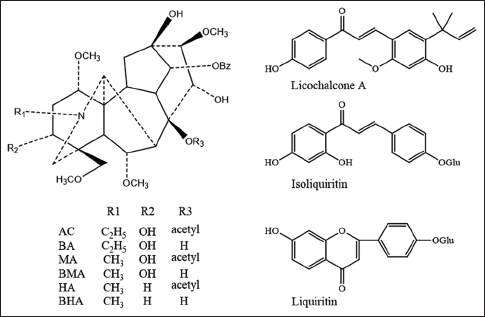 Conclusion: The current study reveals one new quassinoid glycoside and the potential active component (eurycomanone) from E. longifolia for the leukemia treatment. Abbreviations used: COSY: Correlation spectroscopy; HMBC: Heteronuclear multiple-bond correlation; HMQC: Heteronuclear multiple quantum correlation; NMR: Nuclear magnetic resonance; NOESY: Nuclear Overhauser enhancement spectroscopy; TLC: Thin layer chromatography. Background: The mechanism of the immunoregulatory activities of polysaccharide is still not clear. Materials and Methods: Here, we performed the B-cell, T-cell, and macrophage cell proliferation, the cell cycle analysis of macrophage cells, sequenced the transcriptomes of control group macrophages, and Boletus speciosus Frost polysaccharide (BSF-1) group macrophages using Illumina sequencing technology to identify differentially expressed genes (DEGs) to determine the molecular mechanisms of immunomodulatory activity of BSF-1 in macrophages. Results: These results suggested that BSF-1 could promote the proliferation of B-cell, T-cell, and macrophages, promote the proliferation of macrophage cells by abolishing cell cycle arrests in the G0/G1 phases, and promote cell cycle progression in S-phase and G2/M phase, which might induce cell division. A total of 12,498,414 and 11,840,624 bp paired-end reads were obtained for the control group and BSF-1 group, respectively, and they corresponded to a total size of 12.5 G bp and 11.8 G bp, respectively, after the low-quality reads and adapter sequences were removed. Approximately 81.83% of the total number of genes (8,257) were expressed reads per kilobase per million mapped reads (RPKM ≥1) and more than 1366 genes were highly expressed (RPKM >60) in the BSF-1 group. A gene ontology-enrichment analysis generated 13,042 assignments to cellular components, 13,094 assignments to biological processes, and 13,135 assignments to molecular functions. A Kyoto Encyclopedia of Genes and Genomes pathway enrichment analysis showed that the mitogen-activated protein kinase (MAPK) signaling pathways are significantly enriched for DEGs between the two cell groups. Conclusion: An analysis of transcriptome resources enabled us to examine gene expression profiles, verify differential gene expression, and select candidate signaling pathways as the mechanisms of the immunomodulatory activity of BSF-1. Based on the experimental data, we believe that the significant antitumor activities of BSF-1 in vivo mainly involve the MAPK signaling pathways. Abbreviations used: BSF-1: Boletus speciosus Frost polysaccharide. Background: Liver disorder was associated with alcohol consumption caused by hepatic cellular damages. Opuntia ficus-indica fruit extracts (OFIEs), which contain betalain pigments and polyphenols including flavonoids, have been introduced as reducing hangover symptoms and liver protective activity. Objective: To evaluate hepatoprotective activity of OFIEs and isolated compounds by high-speed countercurrent chromatography (HSCCC). Materials and Methods: The extract of O. ficus-indica fruits was fractionated into methylene chloride and n-butanol. The n-butanol fraction was isolated by HSCCC separation (methylene chloride-methanol-n-butanol-water, 5:4:3:5, v/v/v/v). 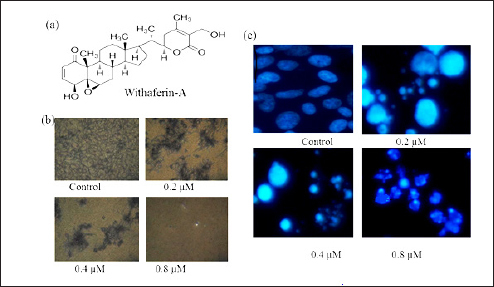 The hepatoprotective activity of OFIEs and isolated compounds was evaluated on rat primary hepatocytes against ethanol-induced toxicity. Antioxidative parameters such as glutathione reductase and glutathione peroxidase (GSH-Px) enzymes and the GSH content were measured. Results: Two flavonoids, quercetin 3-O-methyl ester (1) and (+)-taxifolin, and two flavonoid glycosides, isorhamnetin 3-O-β-d-glucoside (3) and narcissin (4), were isolated from the n-butanol fraction by HSCCC separation. Among them, compound 2 significantly protected rat primary hepatocytes against ethanol exposure by preserving antioxidative properties of GR and GSH-Px. Conclusions: OFIEs and (+)-taxifolin were suggested to reduce hepatic damage by alcoholic oxidative stress. Background: Many exopolysaccharides from the endophytes in medicinal plants possess various potential bioactivities. Materials and Methods: The endophytic fungus JY25 was isolated from the leave of the Chinese medicinal plant Gynostemma pentaphylla and identified as Chaetomium sp. by its phylogenetic and physiological analysis. One exopolysaccharide (EPS) fraction was isolated from the fermentation broth by ethanol precipitation and purified by gel filtration chromatography on Sepharose CL-6B. The molecular characteristics were examined by GC-MS, FT-IR, and multiangle laser light scattering (MALLS). Results: The monosaccharide composition analysis indicated that the purified EPS was mainly composed of glucose, mannose, arabinose, and galactose with the molecular ratio of 78.29: 8.99: 8.64: 4.08. 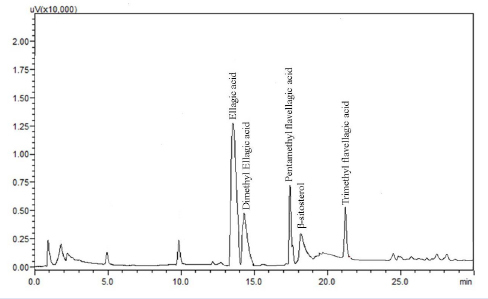 FT-IR spectral analysis of the purified EPS revealed prominent characteristic groups, such as carbonyl bond, pyranose ring, and so on. The weight-average molar mass and the polydispersity ratio of the EPS were revealed to be 1.961×104 g/mol and 1.838, respectively. Furthermore, thermo gravimetric analysis (TGA) indicated that the degradation temperature of the purified EPS was 305°C. The purified EPS from the endophytic fungus Chaetomium sp. displayed antioxidant and antiproliferative activities. Conclusion: The results demonstrated that the EPS could be used as a healthful food and material source in pharmaceutical industries. Abbreviations used: ANOVA: Analysis of variance; DPPH: 2,2-diphenyl-1-picrylhydrazyl; EPS: Exopolysaccharide; FT-IR: Fourier transform infrared spectroscopy; GC-MS: Gas chromatography–mass spectrometry; Mw: Mass weight; MALLS: Multiangle laser light scattering; SEC: Size Exclusion Chomatography; SPSS: Statistical Package of the Social Science; TGA: Thermo gravimetric analysis; TFA: Trifluoroacetic acid. Background: The genus Wikstroemia has about 70 species, but only a limited number of species have been studied chemically. Wikstroemia indica has long been used as a traditional crude drug in China. However, there is no report about the bioactivity of Wikstroemia scytophylla. 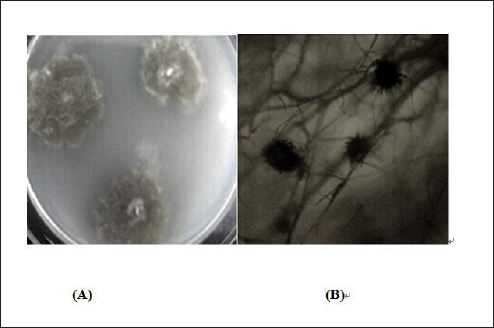 Objective: This paper reports the chemical investigation and biological evaluation of the W. scytophylla. Materials and Methods: The EtOAc extraction of W. scytophylla was isolated using chromatographic methods, and the compounds were analyzed by spectroscopic methods. The in vitro antitumor activities against five human cancer cell lines were performed according to the 3-(4,5-dimethylthiazol-2-yl)-2,5-diphenyltetrazolium bromide method. 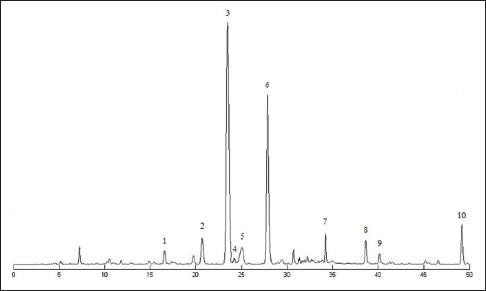 Results: The chemical investigation of the stems of W. scytophylla resulted in the isolation of 12 compounds mainly including one biflavone (1), five flavones (2-6) compounds, and six lignans (7-12), in which compound 8 was a new natural product. Compounds 1 and 7-12 were evaluated for their antitumor activities while these compounds showed weak cytotoxicity with the half maximal inhibitory (IC50) values more than 40 μM. 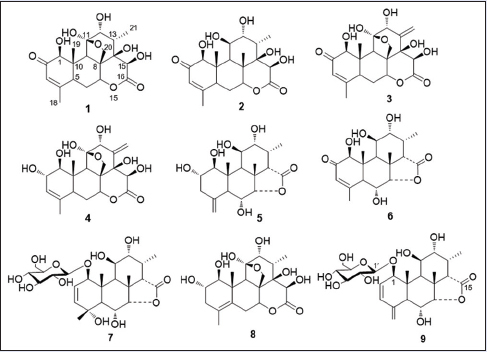 Conclusion: All of these compounds were isolated from this plant for the first time, and compounds 2-12 were first reported from genus Wikstroemia, in which compound 8 was a new natural product. 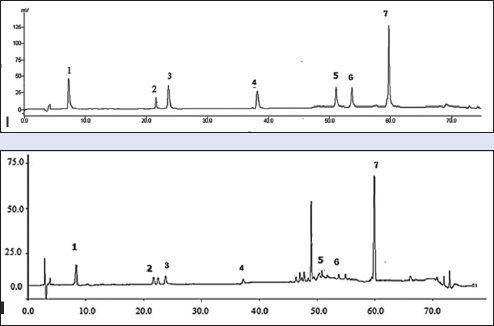 Compounds 1 and 7-12 exhibited weak antitumor activities (IC50>40 μM). The chemotaxonomic significance of all the isolations was summarized. Abbreviations used: MTT: 3-(4,5-dimethylthiazol-2-yl)-2,5-diphenyltetrazolium bromide; IC50: Half maximal inhibitory; HL-60: Human leukemia cell line; SMMC-7721: Human hepatocellular carcinoma cell line; A549: Human lung tumor cell line; MCF-7: Human breast cancer cell line; SW480: Human colon cancer cell line; MS: Mass spectrometry; NMR: Nuclear Magnetic Resonance. Background: The current astringency evaluation for herbs has become dissatisfied with the requirement of pharmaceutical process. It needed a new method to accurately assess astringency. 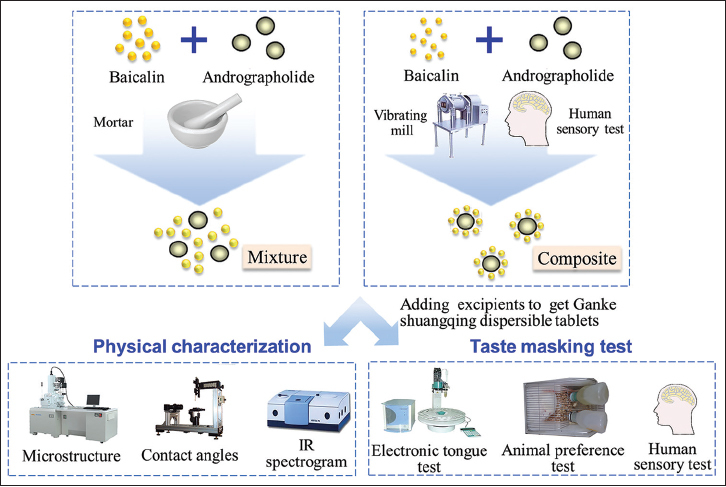 Methods: First, quinine, sucrose, citric acid, sodium chloride, monosodium glutamate, and tannic acid (TA) were analyzed by electronic tongue (e-tongue) to determine the approximate region of astringency in partial least square (PLS) map. Second, different concentrations of TA were detected to define the standard curve of astringency. Meanwhile, coordinate-concentration relationship could be obtained by fitting the PLS abscissa of standard curve and corresponding concentration. 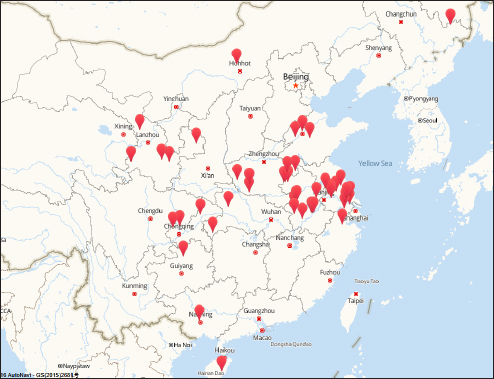 Third, Chebulae Fructus (CF), Yuganzi throat tablets (YGZTT), and Sanlejiang oral liquid (SLJOL) were tested to define the region in PLS map. Finally, the astringent intensities of samples were calculated combining with the standard coordinate-concentration relationship and expressed by concentrations of TA. Then, Euclidean distance (Ed) analysis and human sensory test were processed to verify the results. Results: The fitting equation between concentration and abscissa of TA was Y = 0.00498 × e(−X/0.51035) + 0.10905 (r = 0.999). The astringency of 1, 0.1 mg/mL CF was predicted at 0.28, 0.12 mg/mL TA; 2, 0.2 mg/mL YGZTTs was predicted at 0.18, 0.11 mg/mL TA; 0.002, 0.0002 mg/mL SLJOL was predicted at 0.15, 0.10 mg/mL TA. The validation results showed that the predicted astringency of e-tongue was basically consistent to human sensory and was more accuracy than Edanalysis. Conclusion: The study indicated the established method was objective and feasible. It provided a new quantitative method for astringency of herbs. 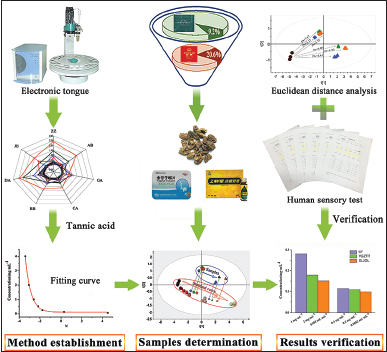 Abbreviations used: CF: Chebulae Fructus; E-tongue: Electronic tongue; Ed: Euclidean distance; PLS: Partial least square; PCA: Principal component analysis; SLJOL: Sanlejiang oral liquid; TA: Tannic acid; VAS: Visual analog scale; YGZTT: Yuganzi throat tablets. Background: Nano bamboo charcoal is being widely used as sustained release carrier for chemicals for its high specific surface area, sound biocompatibility, and nontoxicity; however, there have been no reports on nano bamboo charcoal as sustained release carrier for traditional Chinese medicine (TCM). 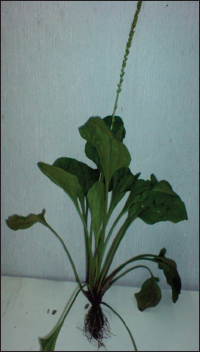 Objective: To study the effect of nano bamboo charcoal in absorbing and sustained releasing Eucommia ulmoides extract (EUE) and to verify the in vitro anticancer effect of the sustained release liquid, so as to provide a theoretical basis for the development and utilization of nano bamboo charcoal as TCM sustained-release preparation. Materials and Methods: The adsorption capacity for the nano bamboo charcoal on EUE was measured by Langmuir model, and the release experiment was carried out under intestinal fluid condition. Characteristic changes for the nano bamboo charcoal nano-drug delivery system with and without adsorption of E. ulmoides were evaluated by scanning electron microscopy, Fourier transform infrared spectroscopy, thermogravimetric analysis, and specific surface area. In addition, the anticancer effect from this novel bamboo charcoal E. ulmoides delivery system was evaluated against a human colon cancer cell line (HCT116). Results: It was found that nano bamboo charcoal exhibits good adsorption capacity (up to 462.96 mg/g at 37°C). The cumulative release rate for EUE from this nano bamboo charcoal delivery system was 70.67%, and specific surface area for the nano bamboo charcoal decreased from 820.32 m2/g to 443.80 m2/g after EUE was loaded. An in vitro anticancer study showed that the inhibition rate for E. ulmoides against HCT116 cancer cells was 23.07%, for this novel bamboo charcoal nano-drug delivery system. Conclusion: This study provides a novel strategy for the delivery of traditional Chinese medicine using bamboo charcoal nano-drug delivery system. Abbreviation used: EUE: Eucommia ulmoides extract. Background: The purple sweet potato, Ipomoea batatas, belongs to the family Convolvulaceae. It is one of the most widely consumed tubers in Asia and is found in many dishes. Many people with diabetes eat purple sweet potato tubers to help reduce blood glucose in China. Objective: To predict the ultrasonic conditions for getting the optimal in vitro antioxidant and antiglycated activity of ultrasonic extracted polysaccharides from purple sweet potato (I. batatas) tubers, the artificial neural network (ANN) regression models was used in this study. 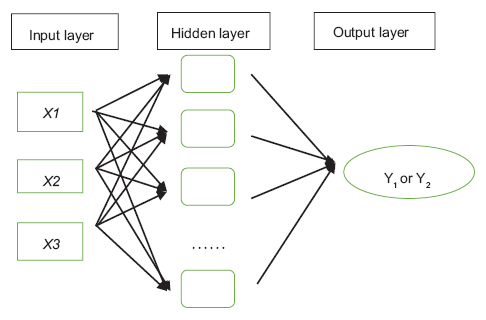 Materials and Methods: The antioxidant activity of polysaccharides was quantified by evaluating the hydroxyl radical scavenging effect after ultrasonic extraction, and the data were used in conjunction with optimized extraction conditions to train the predictive ANN models. Results: The following conditions were predicted to yield optimal hydroxyl scavenging activity: 200 W, 22°C, and 40 min. In contrast, conditions of 230 W, 22°C, and 50 min yielded the greatest inhibitory effect on albumin nonenzymatic glycosylation. The accuracy and predictive ability of the models ranged from good to excellent, as indicated by R2 values ranging from 0.953 to 0.998. Conclusion: The results of the present study showed that ANN predictive models are useful in ultrasonic processing, which can rapidly and accurately predict the optimum extraction conditions for polysaccharides based on their antioxidant and antiglycated activities. In addition, the results of the present study suggest that the consumption of sweet potatoes may help reduce free radicals in the body and prevent or treat diabetes. Abbreviations used: IBP: Polysaccharide of Ipomoea batatas; RSM: response surface methodology; ANN: Artificial neural network; BSA: Bovine serum albumin. Objective: This work aimed to investigate the anti-epileptic effects of valepotriate isolated from Valeriana jatamansi Jones and studied its possible mechanisms. Methods: The anti-epileptic effects of valepotriate were studied using maximal electroshock-induced seizure (MES), pentylenetetrazole (PTZ)-induced epilepsy, and pentobarbital sodium-induced sleeping model in mice. The possible anti-epileptic mechanisms of valepotriate were investigated by analyzing the expressions of GABAA, GABAB, glutamic acid decarboxylase (GAD65), Bcl-2, and caspase-3 in the brain using Western blot assay. Results: The results indicated that valepotriate showed significant anti-epileptic activity against MES- and PTZ-induced epilepsy at doses of 5, 10, and 20 mg/kg, and ED50values for MES- and PTZ-induced epilepsy were 7.84 and 7.19 mg/kg, respectively. Furthermore, valepotriate (10 and 20 mg/kg) can significantly prolong sleeping time and shorten the latency time on the pentobarbital sodium-induced sleeping time test. Furthermore, valepotriate (5, 10, and 20 mg/kg) could significantly up-regulate the expression of GABAA, GAD65, and Bcl-2 and down-regulate the expression of caspase-3, but had no significant effect on the expression of GABAB. Conclusion: The results indicated that valepotriate had anti-epileptic activity and the mechanisms might be associated with regulation of GABA and inhibition of neuronal apoptosis. Background: Sugemule-3 (SD) is a traditional Chinese medicine with protective effect of myocardium. However, the underlying mechanisms of the effect had not been elucidated. Materials and Methods: In the present study, the serum of SD was prepared. A model of β-adrenergic agonist isoprenaline (ISO)-induced H9c2 cardiomyocytes injury was established in vitro. The changes in cell viability were examined to determine the available concentration of ISO and serum of SD. ELISA, terminal deoxynucleotidyl transferase-mediated dUTP nick end-labeling assay, and flow cytometry were used to detect the effect of serum of SD on oxidative stress and apoptosis. The expression levels of the mitochondria-dependent apoptotic pathway and mitogen-activated protein kinase signalling-related proteins were analyzed. 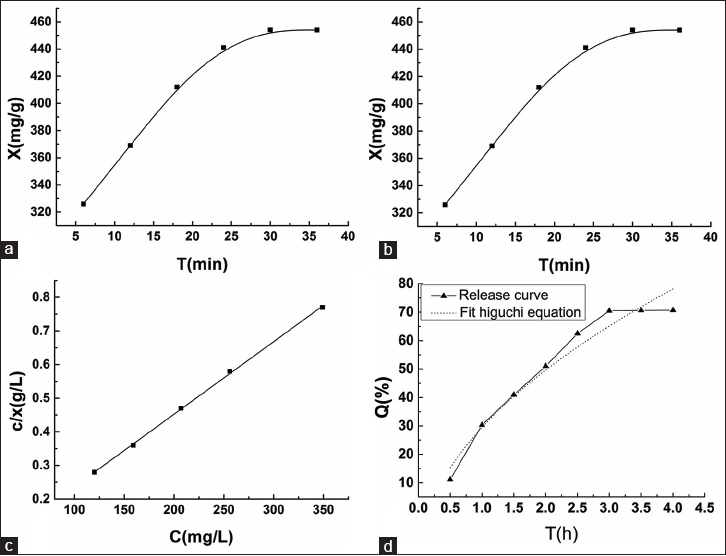 Results: Incubation with different dose of ISO (0.015, 0.01, 0.005, and 0.0025 mol/L) for 24 h caused dose-dependent loss of cell viability and 0.01 mol/L of ISO approximately reduced the cell viability to 50%. 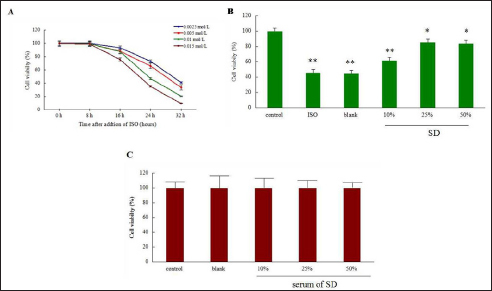 Pretreatment with 50 μ mol/L serum of SD effectively decreased the levels of ISO-induced cell toxicity. 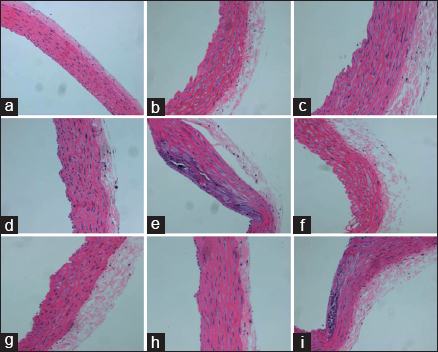 Serum of SD relived ISO-induced oxidative stress and apoptosis in H9c2 cardiomyocytes. A further mechanism study indicated that serum of SD inhibited the mitochondria-dependent apoptotic pathways and regulated the expression levels of Bcl-2 family. ISO activated ERK and P38, whereas serum of SD inhibited their activation. Conclusion: Serum of SD inhibits the ISO-induced activation of the mitochondria-dependent apoptotic pathway, oxidative stress, and ERK, P38 inactivation. Serum of SD is used for the treatment of ISO-induced cardiomyopathy. Abbreviations used: ELISA: Enzyme-linked Immunosorbent Assay; TUNEL: TdT-mediated dUTP nick end labeling; MTT: 3-(4,5-dimethyl-2-thiazolyl)-2,5-diphenyl-2-H-tetrazolium bromide, DMSO: dimethyl sulfoxide; MDA: Malondialdehyde; SOD: Superoxide Dismutase; GSH-Px: Glutathione peroxidase. Background: Withaferin-A (WF-A) is a well-known dietary compound isolated from Withania sominifera. It has tremendous pharmacological potential and has been shown to exhibit antiproliferative activity against several types of cancerous cells. Currently, the main focus of anti-cancer therapeutic development is to identify apoptosis inducing drug-like molecules. Osteosarcoma is a rare type of osteocancer, affecting human. The present study therefore focused on the evaluation of antitumor potential of WF-A against several osteosarcoma cell lines. Materials and Methods: MTT assay was used to evaluate WF-A against osteosarcoma cell lines and to calculate the IC50. DAPI staining was used to confirm the apoptosis inducing potential of WF-A. Mitochondrial membrane potential, reactive oxygen species (ROS) assay, and Western blotting were used to confirm the basis of apoptosis. Results: The results revealed that that WF-A exhibited strong antiproliferative activity against all the cells lines, with IC50 ranging from 0.32 to 7.6 μM. The lowest IC50 (0.32 μM) was observed against U2OS cell line and therefore it was selected for further analysis. DAPI staining indicated that WF-A exhibited antiproliferative activity via induction of apoptosis. Moreover, WF-A induced ROS-mediated reduction in mitochondrial membrane potential ΔΨm) in a dose-dependent manner and activation of caspase-3 in osteosarcoma cells. Conclusion: We propose that WF-A may prove a potent therapeutic agent for inducing apoptosis in osteosarcoma cell lines via generation of ROS and disruption of mitochondrial membrane potential. Abbreviations used: WA: Withaferin A; ROS: Reactive oxygen species; OS: Osteosarcoma; MMP: Mitochondrial membrane potential. Background: Raw Moutan cortex (RMC) is an important Chinese herbal medicine. Comprehensive and objective quality evaluation of Chinese herbal medicine has been one of the most important issues in the modern herbs development. Objective: To evaluate and compare the quality of RMC using the weighted gray correlation- Technique for Order Preference by Similarity to an Ideal Solution (TOPSIS) method. Materials and Methods: The percentage composition of gallic acid, catechin, oxypaeoniflorin, paeoniflorin, quercetin, benzoylpaeoniflorin, paeonol in different batches of RMC was determined, and then adopting MATLAB programming to construct the gray correlation-TOPSIS assessment model for quality evaluation of RMC. Results: The quality evaluation results of model evaluation and objective evaluation were consistent, reliable, and stable. Conclusion: The model of gray correlation-TOPSIS can be well applied to the quality evaluation of traditional Chinese medicine with multiple components and has broad prospect in application.